Algeria, in northwest Africa, is part of the region known as the Maghrib. The continent's second-largest nation (after Sudan), Algeria borders Tunisia, Libya, Niger, Mali, Mauritania, Morocco, and Western Sahara and stretches from its 1,104-km (686-mi) coastline on the Mediterranean Sea south through a varied topography to the vast desert region of the Sahara (see map). Algiers, the capital and leading port, is one of the largest and fastest-growing cities in Africa. Most Algerians are Muslims (believers in Islam), and the star and crescent moon are popular Muslim symbols. The colors red, white, and green are found in the flags of the Arab countries of North Africa. Given its geographic location, Algeria has long interacted with African, Asian, and European cultures. The bitter Algerian War (1954-62) that ended French colonial rule has significantly influenced Algeria's national identity. Since gaining independence, Algeria has tried to liberate itself from the economic legacy of colonialism through ambitious development plans financed by the sale of petroleum and natural gas. Its prominent position among Third World nations enabled it to play a major role in international diplomacy until the rise of an antiforeign fundamentalist movement in the 1990s. Algeria consists of a series of contrasting, approximately parallel east-west topographic zones. The narrow, discontinuous alluvial plains along the coast, which contain the most fertile land, are separated from the Sahara by the ranges and plateaus of the Atlas Mountains. The Tell Atlas, reaching heights of more than 2,300 m (7,550 ft), includes the Hodna range and the spectacular Djurdjura massif of Kabylia, in northeastern Algeria. Separating the Tell Atlas from the Saharan Atlas is a semiarid plateau with an average elevation of 1,100 m (3,610 ft). In the east the plateau merges with the Aurès Mountains, which include Mount Chélia (2,331 m/7,648 ft), the highest peak in northern Algeria. South of the Saharan Atlas is the immense Sahara, with its gravel expanses, occasional plateaus, sand dunes (ergs), and the fantastic, lunarlike Ahaggar Mountains, where Mount Tahat, the nation's highest peak, rises to 3,003 m (9,852 ft). Northern Algeria has a history of seismic disturbances. The Oasis de Tamantit et Sid Ahmed Timmi in Adrar is a National Heritage Monument. Northern Algeria, in the temperate Mediterranean zone, has seasonal average temperatures ranging from 11° C (52° F) to 25° C (77° F). In the ranges and plateaus of the Atlas Mountains, mean temperatures range from 4° C (39° F) to 28° C (82° F). Temperatures in the Sahara often reach 50° C (122° F) in summer but can drop to -10° C (14° F). Extreme daily temperature variations are common when the scorching sirocco winds blow in from the desert. Rainfall is abundant in the coastal region, although less rain falls in the west (380 mm/15 inches annually in Oran) than in the east (660 mm/26 inches annually in Algiers). The Tell Atlas is also much drier in the west than it is in Kabylia, which receives about 1,020 mm (40 in) of rainfall a year. The interior plateau receives about 300 mm (12 in) of rainfall annually, the Saharan Atlas about 250 mm (10 in), and the practically rainless Sahara less than 13 cm (5 in). The Chéliff River in the coastal plain, the only significant stream, is unnavigable, but it provides water for irrigation. In the interior there are seasonal streams called wadis and many shallow salt lakes called shatts (or chotts). Most of Algeria's agricultural land is on the coastal plain, which also features indigenous grapevines. The Tell Atlas is forested with cedar, pine, and cork oak. There are also fig trees and olive groves. The semiarid plateau provides pasturage with drinn and esparto grass. Date palms flourish at Saharan oases, and acacias dot the desert. In the late 1980s the government abandoned for financial reasons the planned "green wall" of vegetation across the northern edge of the Sahara, intended to impede desertification. Algeria's wildlife includes fennecs (foxes), jerboas, boars, gazelles, and jackals. Only 3% of the country is arable. Forests cover 2% and pastures 13% of the land. The inhospitable Sahara has petroleum deposits and large natural gas reserves. There are also deposits of iron ore, phosphates, mercury, lead, zinc, and uranium. Algerians are primarily of Arab and Berber descent. Arabic, the national language, is spoken by about 82% of the population, but Berbers have historically resisted "Arabization." They protested a new law introduced in 1998 that made Arabic the only language permitted in public life. 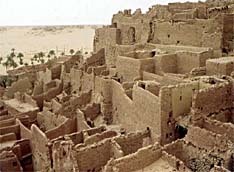 Berber dialects are used by the Kabyle east of Algiers, the Shawia of the Aurès Mountains, the M'zabis (Mozabites) centered in the oasis city of Ghardaïa (see M'Zab Valley), and the Tuareg in the deep Sahara. French remains an important language, although English officially became the major foreign language taught in universities in 1996. About 1 million Algerians live abroad, chiefly in France. In colonial times, Algeria's population included more than 1 million French-European settlers and 150,000 Jews. More than 80% of the 75,000 remaining foreigners left the country after they were threatened with death by Muslim extremists in the 1990s. Almost all Algerians are Sunnite Muslims, although political Islamicism has intensified social and cultural tensions between secular and traditional groups and communities. Over 90% of the population live in the north on about 20% of the land. The nation's largest cities  Algiers, Oran, Constantine, and Annaba  are located there. Birth control and domestic turmoil have reduced population growth from more than 3% annually to 2.4%. About 39% of the population are under the age of 15. Economic programs that are capital intensive rather than labor intensive have contributed to an unemployment rate of about 25% and severe shortages of housing and consumer goods. With 90% of the population illiterate at independence, the government has regularly allocated 25-35% of its budget to education. Today more than 90% of all children attend school through grade six, and more than 50% attend secondary school. Primary classes are taught in Arabic, but controversies over Arabization have kept French important in higher education, especially in vocational and technical training. Algeria's admirable achievements in education have been matched in medicine. In 1994 there were nearly 26,000 physicians, compared to about 300 in 1962. Except in remote areas, Algerians now have access to practically free (since 1974) medical care. Preventive medicine is particularly emphasized.